Enterprise Ireland is holding its International Markets Week at the RDS today. The event sees the state agency bring home many of its markets advisors - staff posted across the globe who help Irish firms exporting or companies who are thinking of setting up operations in other countries. These experts will be available to meet up-and-coming Irish firms who will also have the opportunity to hear from established Enterprise Ireland clients with successful international operations and pick their brains. For the first time, International Markets Week will also feature a dedicated Brexit Zone, where experts will offer advice and assistance to 176 client firms who export to the UK. 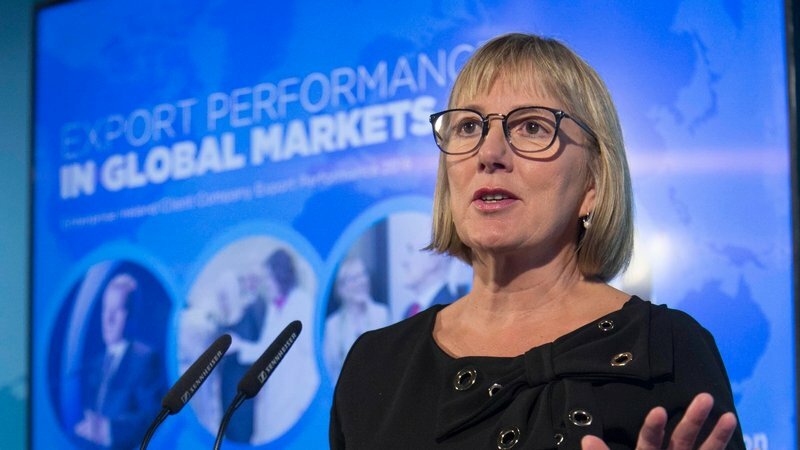 Enterprise Ireland chief executive Julie Sinnamon said that Brexit issues have played a big part in the state agency's business in the last year. The event at the RDS will see over 2,000 meetings with 600 companies and EI staff between today and Friday. Those companies were asked about their level of preparedness for Brexit and over 60% of them said they had not yet taken steps to address Brexit. Ms. Sinnamon said that is why International Markets Week is so important as the event will see 130 staff from all over the world, sitting down with these companies and working out their diversification plans in order to start that journey. 38% of companies surveyed said they had started to gear up for Brexit, she added. The Enterprise Ireland CEO said that companies are still facing a lot of uncertainty, while currency volatility has been a big issue. While some companies are still in denial, Ms. Sinnamon said that the level of companies stepping up and taking action is really increasing. Every week in Enterprise Ireland's Paris office about five new companies are coming in find out how they can develop exports into France, she explained. At today's Enterprise Ireland event, Andrea Cawley - Sales and Marketing Manager with Automatic Plastics - said the UK had been a very successful market for the company. Describing the UK as an "easy market", she said it has no language barriers and good logistics. But she said the company feels it needs to be "Brexit ready" and with long lead-in times in its industry, Automatic Plastics needs to be looking to other markets now - including France and the Benelux countries. She said that even if Brexit is a soft Brexit, what the company is doing now is going to only benefit it in the future. Barry Napier, chief executive of Cubic Telecom, said his company is looking to further afield to expand its markets. Mr. Napier said the company started working with Enterprise Ireland about four years ago doing trade missions into Japan and China. China is now the company's main focus for expansion and it has secured two operating deals over there in the last two years. He said the company now sees the "land of opportunity" lying in the Asian markets, while the US markets also remains a big opportunity. Mr. Napier also noted that Irish people have landed key executive roles in foreign markets, which can help companies in their expansion as they make connections with these business leaders. Marina Donohoe, Director of the UK and Northern Europe for Enterprise Ireland, said the UK is still Ireland's largest export market, it is still the fifth biggest economy in the world and it is still predicting positive economic growth. While it represents 35% of the export wins for Irish companies, Ms. Donohoe said that Enterprise Ireland sees the diversification agenda as a huge issue in the future. She said that while the relationship with the UK will certainly change, the agency is working really intensively with companies to help them build the business in other markets. Earlier this year, Enterprise Ireland launched its euro zone strategy, and Ms. Donohoe said there is a lot of interest at International Markets Week from companies to meet with teams from around the euro zone - an area which is extremely relevant for Irish firms as there is zero currency risk and it has a huge population.